If you think ‘yoga is for girls’, or that it’s all about relaxing, think again. Bikram Yoga Townsville is attracting male and female athletes to its 38-degree studio who want to challenge themselves or do some post-training rehab. Plus an increasing number of previously ‘yoga shy’ men, like Brazilian Jiu-Jitsu coach Eric Lemoine, are warming to it. We caught up with Eric, plus Jason (Jay) McDonald from our local Bikram studio, to discover the physical appeal of the popular style. You could say Eric was a bit of a ‘tough guy’. He was in the army and was deployed overseas numerous times, including Afghanistan, and used his extensive martial arts background to teach hand-to-hand combat. He’s now coaching Brazilian Jiu-Jitsu, a sport that is touted to flourish here in the same way it has in the US, and he oversees athletes going to state and Pan Pacific competitions. 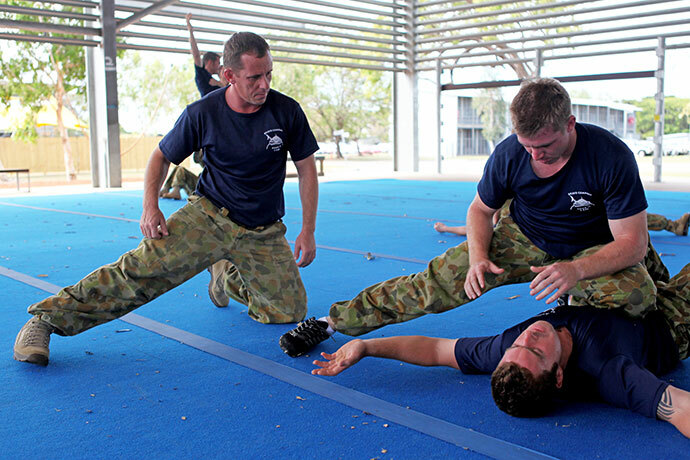 Eric Lemoine instructing military self defence. But there was a time when Eric couldn’t train — he couldn’t even get onto the mat due to the level of pain in his neck, shoulders, back and hips from years of physical army work and high-intensity sport. After seeing numerous physios, he was in WA visiting his partner Wendy when she convinced him to try Bikram yoga. “I initially said ‘I don’t want to do yoga — yoga’s for girls’,” Eric admits. “But the heated aspect appealed to me, so we did it, and after my first session I said, ‘That’s ridiculous’. I was very fit, and yet I found it so, so hard. My expectations were totally off. Eric and Jay demonstrating one of the 26 Bikram Yoga postures. In a nutshell, Bikram Yoga is a 90-minute class in a room heated to 38C with 40% humidity where participants move through the 26 postures in the sequence. There are no headstands or any of the more complex gravity-defying poses. Bikram Yoga Townsville will celebrate its one-year anniversary in October, and while co-owner Jay says the numbers of men doing Bikram are steadily growing, the potential is still huge for those looking for a physical challenge or as a form of intensive post-training recovery. While Bikram is challenging, all participants go at their own pace. “Bikram is great mentally, physically, and emotionally for everyone, but a lot of guys like that physical challenge that this style of yoga offers. In saying that, everyone still goes at their own pace: Nearly every guy who’s been in needs to take a knee [a break] and we won’t judge or criticise people for sitting down and relaxing for a bit,” explains Jay. Jay was in the same boat as Eric when he discovered Bikram. Injured from years of kickboxing, then switching to a relatively sedentary 12-hour-day job, one day something in his lower back just ‘went’ and he spent the next five years fighting debilitating sciatica. His physio recommended yoga and, once angry and frustrated that he couldn’t move, Jay is now pain-free. “It’s OK to push yourself, and push yourself hard, but you need to give back to the body; you can’t just take-and-take-and-take,” Jay says. “You won’t hear me criticising runners and triathletes because what they do is phenomenal, but they just need to give something back to their body to recover and for rehabilitation and prevention. That’s the best way — to prevent it before the injuries happen. Bikram Yoga is suited to the absolute beginner and the advanced practitioner. You can go totally at your own pace, but it has the potential for an awesome physical workout. 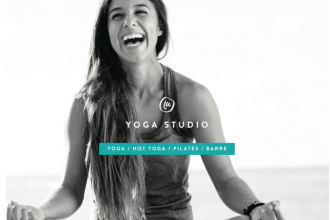 Bikram Yoga is currently offering a special (as of September 1, 2015) – pay $39 and get 30 days of unlimited yoga. View the Bikram Yoga Townsville class timetable in our events calendar.